Editor’s note: Groundspeak Lackeys are traveling thousands of miles from H.Q. 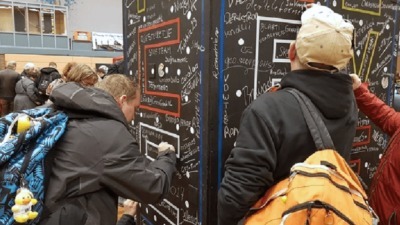 throughout the year to share smiles, shake hands, and make geocaching memories at nearly twenty Mega-Events worldwide. 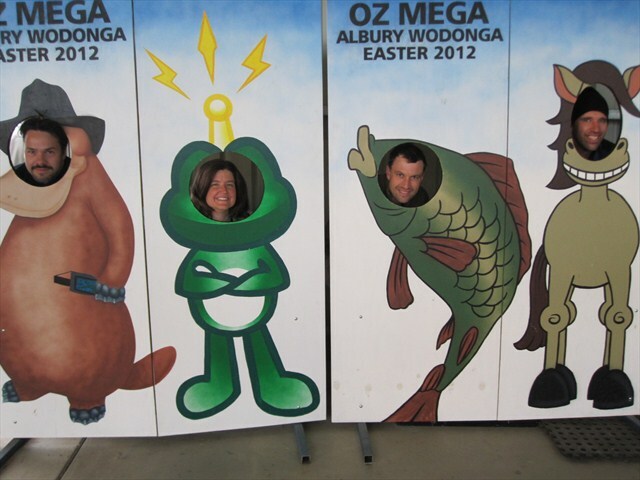 Jen Sonstelie, aka powpea, and Nate Irish, aka OpinioNate, attended the Australian Mega-Event OZ MEGA ALBURY WODONGA (GC2Q4JF). Jen has been a Lackey since 2009 and works as the Director of Marketing. This is Jen’s account of her trip. 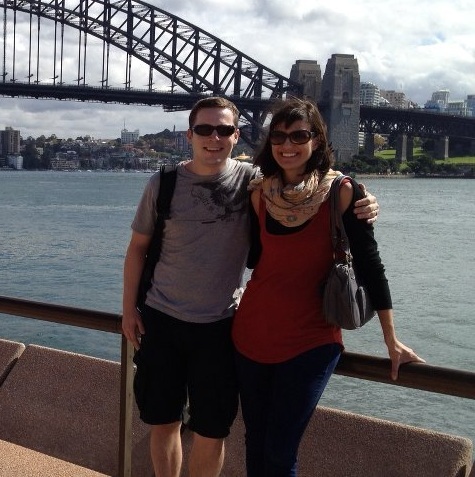 At the end of March, my husband Nate (OpinioNate – also a Lackey) and I flew to Melbourne, Australia, the first stop on our way to the OZ MEGA ALBURY WODONGA. We had a few days to see the sights before driving to the Mega-Event, which was about 4 hours north of Melbourne in the twin cities of Albury-Wodonga. After picking up our registration packet, we met the farmers 5, some of the event organizers. We then sat down to peruse through all the info. 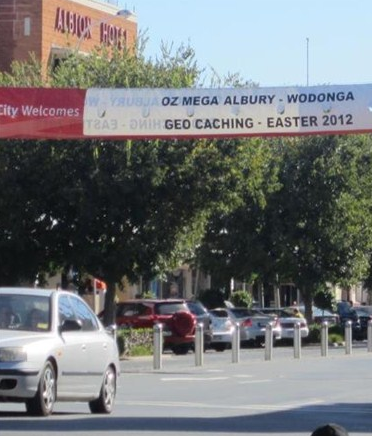 35 temporary caches (a mix of virtuals and containers) had been set up in interesting locations around Albury-Wodonga for the duration of the Mega. We decided to discover the area through the caches, assuming we’d meet people along the way. Now here’s the really embarrassing part. When we left the U.S., Nate and I both thought the other person packed the GPS device. Fortunately, a vendor at the Mega was selling devices, so we invested in a new one. We plugged in the coordinates for the temporary caches, loaded up a Pocket Query of permanent caches in the area, and headed out on our first adventure. My favorite cache that day, The ol’ stock route #2, took us to a wooden pedestrian and biking bridge over the Murray River. It was a beautiful location and the hide was really creative. We were the first team to arrive at the location, but four more teams were assisting with the search by the time the cache was found. After dinner, we headed to the Mega-Event entertainment area, where a stage and a gigantic blow-up screen were set up. Greg, the President of the Mega organizing committee, had asked Nate and me to cut the opening ribbon, but he said there was an opening night surprise that needed to happen first. Nate and I speculated as to what this might be, hoping that we would not be subjected to a pie-in-the-face or forced to sing on stage. Fortunately, we were safe, but another geocacher (whose name had been drawn the night before) was at that moment on a plane, preparing to tandem skydive into the event. Greg announced this to the crowd and we all looked skyward for the plane. Our necks craned, we followed its light back and forth across the night sky for several minutes. The skydivers left the plane and the crowd moved over to the landing field, which was illuminated with headlights and colored flares. And then we waited, and waited, and waited, but the skydivers didn’t appear. Lazy Harry, that night’s entertainer, returned to the stage as we waited for news of our missing skydiving geocacher and her tandem partner. Eventually the call came to tell us that they were fine and on their way to the event. 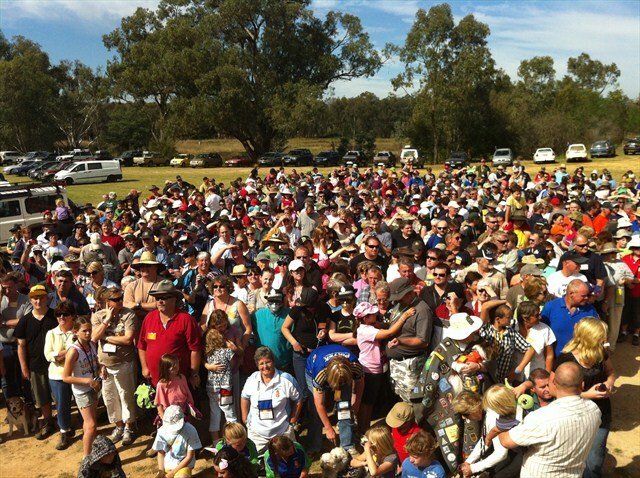 When they arrived, the geocacher shared her story onstage. Apparently they had not been able to spot the landing site from the air, so they had landed in a nearby field. They hiked for 2 km, climbed over a barbed-wire fence and came upon a pub, which fortunately happened to be open (it was Good Friday, so a lot of places were closed). Given that all turned out well in the end, I thought this made an even greater opening event. 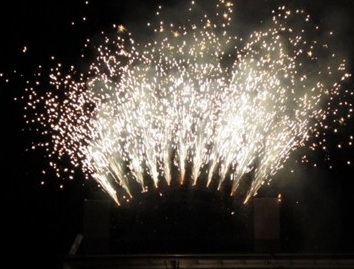 The evening closed with a fireworks display off a replica of the Sydney Harbor Bridge. The next morning, we drove to the Mega grounds to meet Dicksontwo, a geocaching team we had met the night before, for coffee. Before we met up with them, Nate decided that he needed to buy a hat. While perusing the booth, he noticed the nametag of the woman next to us (hippihiiri) and saw that she was from Finland. 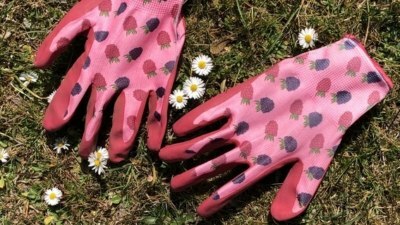 We talked to her for a time about her travels and met up with Dicksontwo as we spoke. It turns out that the coffee vendor was at another event that day, so Dicksontwo invited all of us (Nate, hippihiiri, and me) to go geocaching with them. They were finishing off the 35 temporary caches, but we stopped for plenty of permanent caches along the way. One cache, Wiradjuri, took up nearly an hour of our time because of a few mistakes on our part (driving somewhere we should have walked, ending up on the wrong side of a river). The less-than-straightforward adventure made us all the more determined to find the cache, which, of course, we did. Our other favorite cache of the day involved a visit to the Splitters Creek Winery. 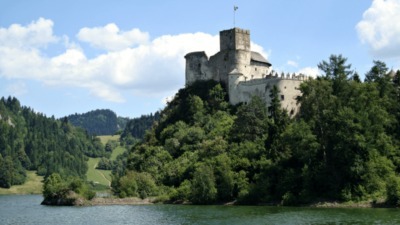 We had lunch in the shade at this incredibly gorgeous location—with vineyards, a lake, and parrots flying overhead. On our way back to the Mega, we saw a mob of kangaroos. Although Dicksontwo were none too fond of kangaroos (like most Australians), they were kind enough to pull over to let the three non-locals in the car watch the kangaroos with immense fascination. The Saturday evening entertainment was an ABBA cover band called BABBA. Ever since seeing Mamma Mia on Broadway, I’ve had a minor obsession with ABBA. 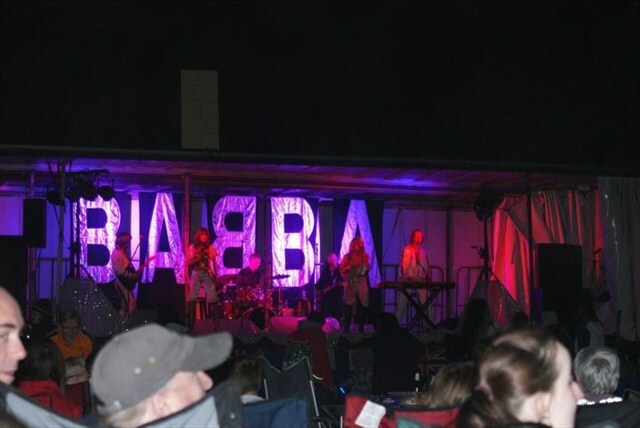 After seeing BABBA, I’ve decided that ABBA cover bands should be a staple at geocaching events. Post-show, we said goodbye to our new geocaching friends. I hope that we’ll have a chance to see them again at other events around the world. Or maybe at the next Australian Mega, since Nate and I are ready to move there.